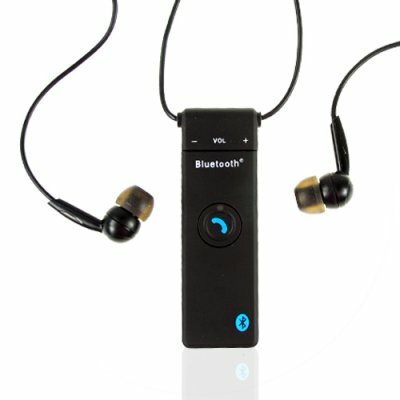 Successfully Added Stylish Bluetooth Stereo Headset - Handsfree Calls + Music to your Shopping Cart. For making handsfree Bluetooth calls from Bluetooth enabled mobile phones and wirelessly receiving music with incredible sound output, little can compare to this stylish looking mini Bluetooth Stereo Headset. With simple one button pairing and operation, this Bluetooth Headset with a built in MIC will be giving hours of listen and talking time, as well as Headset, Handsfree, and A2DP profiles, and 2 x 12mW sound, perfect for listening to calls or to music. Its slim look, along with its necklace hanging design are both attractive to the eye and very convenient in use. Make your busy life easier, and more fun with this wholesale priced Bluetooth Stereo Headset..
on 2009-06-24 01:31:02 Great Value!!!!!!!! Works Very Well with the Mobile Phone Dual Sim Watches and Modern Dual Sim Mobiles off this site,Sound Clarity Very Good. 5 Days to Deliver to England, U.K. by DHL. on 2007-11-10 23:28:27 Thumbs up! This headset is very good at what it does. It paired with my phone quickly and without any trouble. The only problem is that the earpieces are quite uncomfortable and you cannot connect your own pair. Overall though it is a great, cheap bluetooth headest.